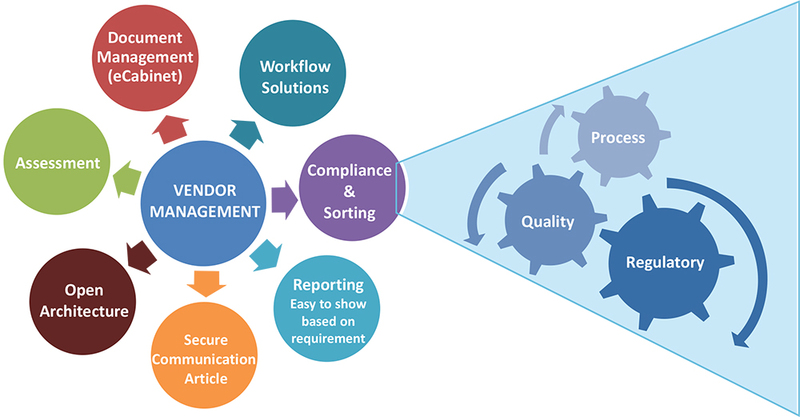 RxOffice Vendor Management Portal is a web‐based application that acts as a mechanism for organizations to manage their vendors, providing them with clear visibility into cost, risk,compliance, and efficiency. Onboarding vendor is an easy 4 step process with registration on customized webpage,review of vendor, approval as per workflow and finally assessment based on vendor. Collaborative, customizable business process workflow solution to manage the risks and to conduct due diligence audits based on different types of vendors. Reviews vendor from a regulatory, process & quality compliance perspective.System establishes internal controls and on‐going built in monitors to determine whether the vendor complies with the law. Assists organizations to request and review the vendor’s policies, procedures,internal controls, and training materials. Vendors can easily upload/search/review documents (such as Certifications, Insurance Certificates, NDA's, Agreements...). Assists organizations to effectively meet compliance requirements, efficiently monitor their relationships with the vendors and to reduce potential risk to customers. Reliable, real time and timely reports measuring productivity, due diligence, risks and gross profits. Internal secure messaging connects vendors & clients and adds better communication channel. It has an ability to send individual/bulk secure messages manually/automatically to vendors & 3rd party vendors.